1.Capacity, knowledge, or skill that matches or suits an occasion, or makes someone eligible for a duty, office, position, privilege, or status. 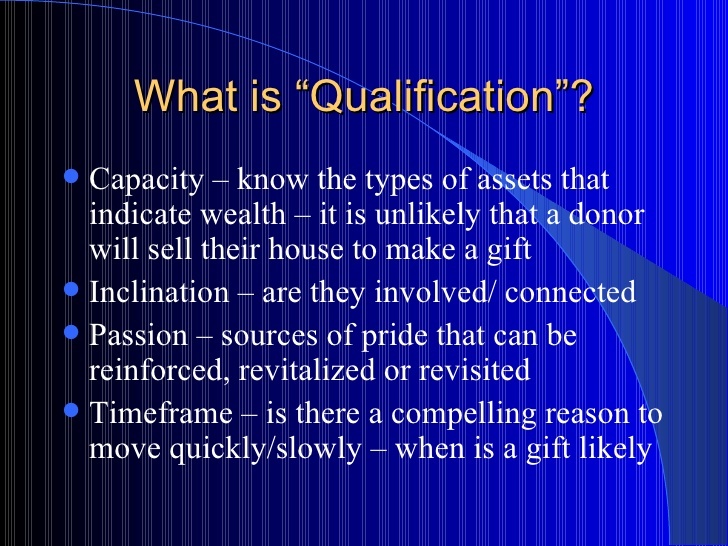 Qualification denotes fitness for purpose through fulfillment of necessary conditions such as attainment of a certain age, taking of an oath, completion of required schooling or training, or acquisition of a degree or diploma. Qualification does not necessarily imply competence. 2.Precise limitation (from general to particular) of language, scope, or terms that would otherwise be interpreted broadly or differently.